Aebleskiver (or Ebelskiver) are puffy Danish pancake balls and a traditional Danish dessert most often served during the Christmas season. Enjoy them year-round as a delicious breakfast treat! Whether you refer to them as aebleskiver or ebelskiver (same pronunciation, different spelling), the actual word in Danish is Æbleskiver and it means “apple slices” because traditionally these were made by putting a small slice of apple in the center while cooking them. But from what I’ve read, the tradition of putting apple slices in the center of aebleskiver has waned in Denmark and that’s no longer a common practice. 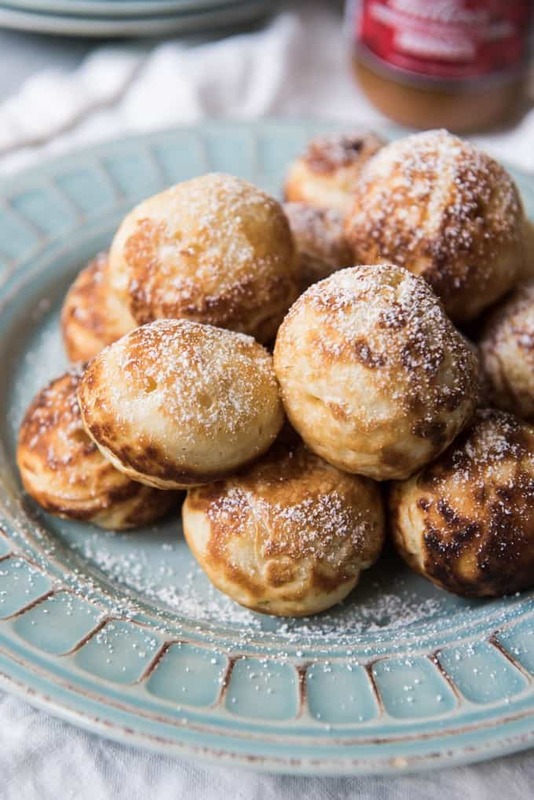 Even though they are light and fluffy, aebleskiver aren’t hollow in the center like you might think. 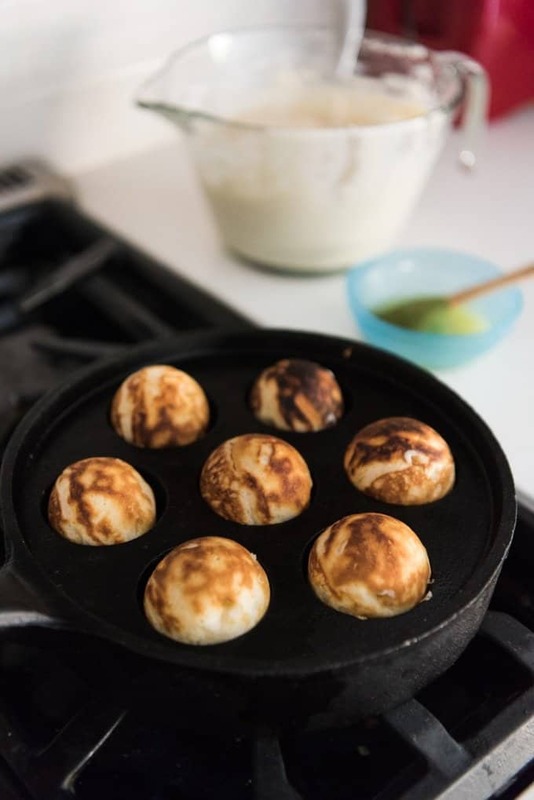 The batter puffs as it cooks in a special aebleskiver pan, and you turn the pancake balls with a knitting needle (the traditional tool used by Danes for turning aebleskiver), chopstick or wooden skewer. The resulting golden brown sphere is something like a delicious cross between a pancake and a donut, although they are slightly airier and lighter than either of those. Cooked aebleskiver get dusted with powdered sugar before being served with honey or jam. 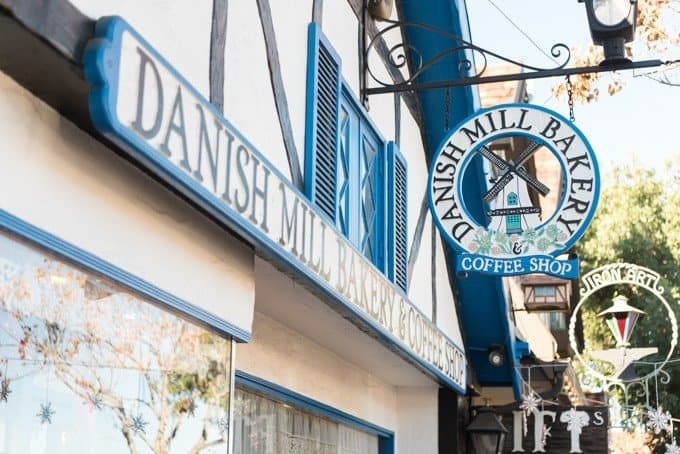 While I’m part Danish, I didn’t actually grow up with aebleskiver and the first time I ever tried them was in Solvang, California. 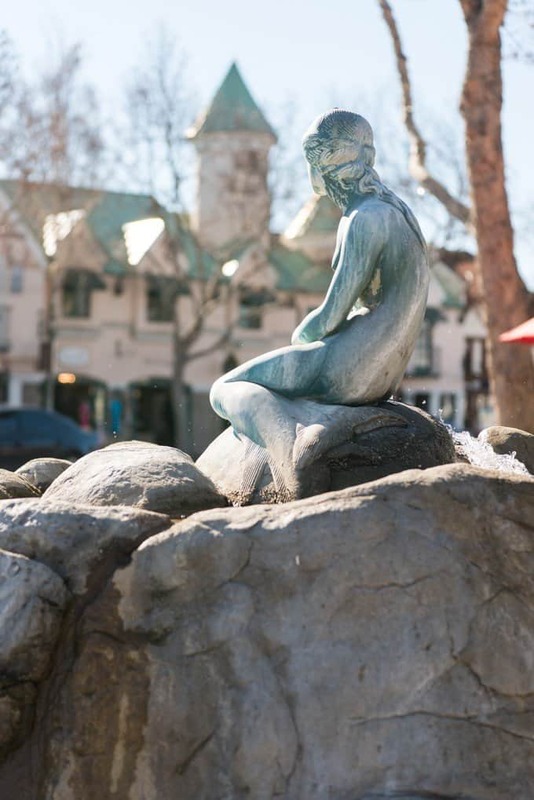 Solvang is a charming and quaint little town known for being one of the most authentic European villages in the USA, along with Frankenmuth, MI, Helen, GA, Vail, CO, and Leavenworth, WA. We did a weekend trip to Solvang with our girls this past January and loved exploring the beautiful shops, admiring the art and architecture that reminded us of our travels through Europe, and enjoying the delicious pastries and other Danish food like these aebleskiver. 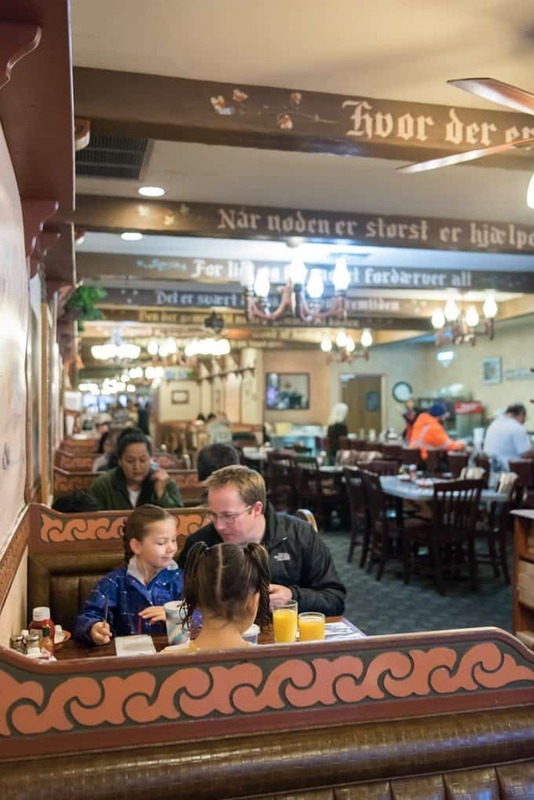 There are a few restaurants known for aebleskiver there and you can even watch the cooks turning row after row of these doughy spheres to cook them before they are brought to your table piping hot with jam for dipping. But really you could serve them with anything you can think of from maple syrup to Nutella to caramel sauce. 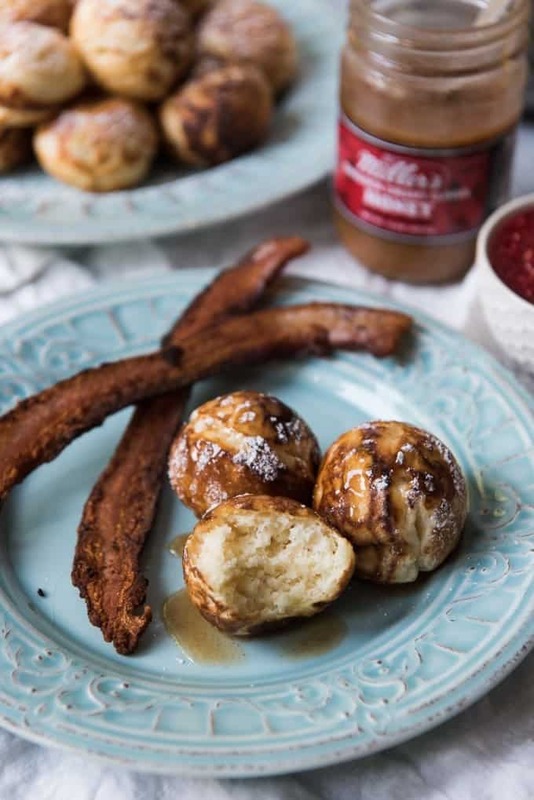 We enjoyed a fun and delicious breakfast of these authentic Danish aebleskiver there! Needless to say, we didn’t leave Solvang without buying a cast-iron aebleskiver pan so I could make them back at home. 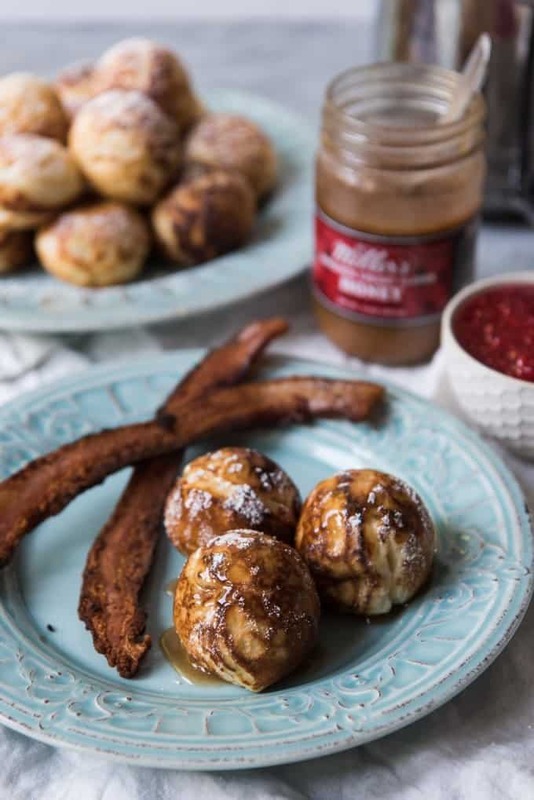 Incidentally, my favorite topping for aebleskiver is Miller’s Cinnamon Creamy Honey, which you can see in the pictures in this post. 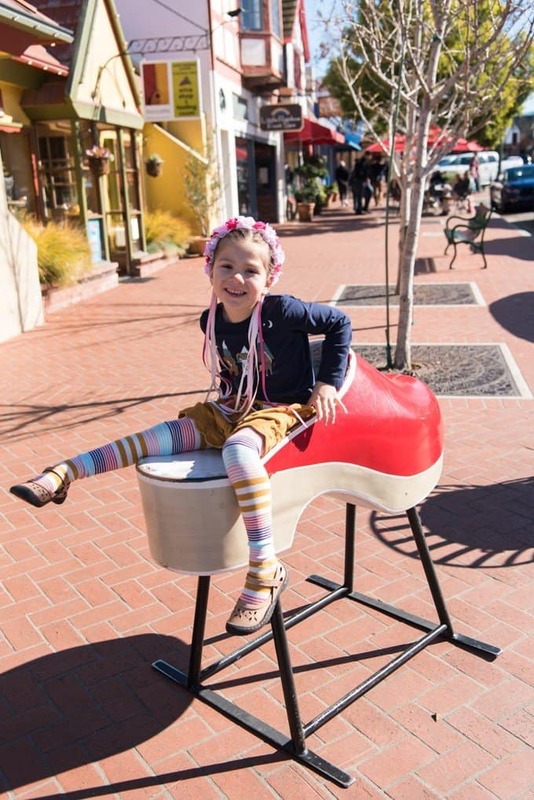 This post isn’t sponsored in any way by Miller’s Honey but we just happen to be good friends with the Miller family and totally support them and their family-run beekeeping business! We’ve even been able to suit up in bee suits and go check out the hives with Jason Miller, who is taking over the family business from his dad. 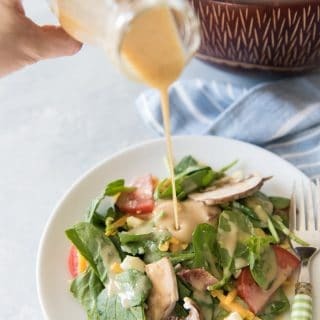 I haven’t ever seen their cinnamon creamy honey in stores, even though you can get their regular creamy honey at many major grocery stores in the western U.S. (which if you’ve never tried creamy honey, you absolutely need to! ), but you can buy the cinnamon version from the Miller’s Honey online store and a few other places I found online and have it shipped to you (again, this post isn’t sponsored and I’m not an affiliate for Miller’s Honey or their products – this is just a product I love and want to share with you!). 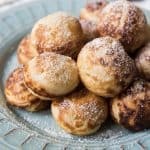 This Danish aebleskiver recipe is really easy and will look familiar if you have ever made waffles or pancakes from scratch. It uses staples like flour with some baking powder and baking soda for leavening, along with a little bit of sugar for a hint of sweetness. Then egg yolks, melted butter, and buttermilk are stirred in just until everything is combined before folding in stiffly beaten egg whites. The trickiest part is learning to cook them, but even that isn’t difficult as long as you have the right tools at hand. You can purchase an aebleskiver pan at local kitchen stores or sometimes places that carry cast-iron pans like outdoor or sporting goods stores, but the easiest way is probably to just order one online like this one from Amazon. I have limited kitchen storage and I don’t like having extra pans or appliances that don’t get used often, but this is totally a worthy purchase because aebleskivers are part of our regular breakfast rotation, right along with buttermilk pancakes, waffles, french toast, and macaroni & eggs with biscuits. They are just so easy and fun to make, not to mention delicious and a favorite for our girls. 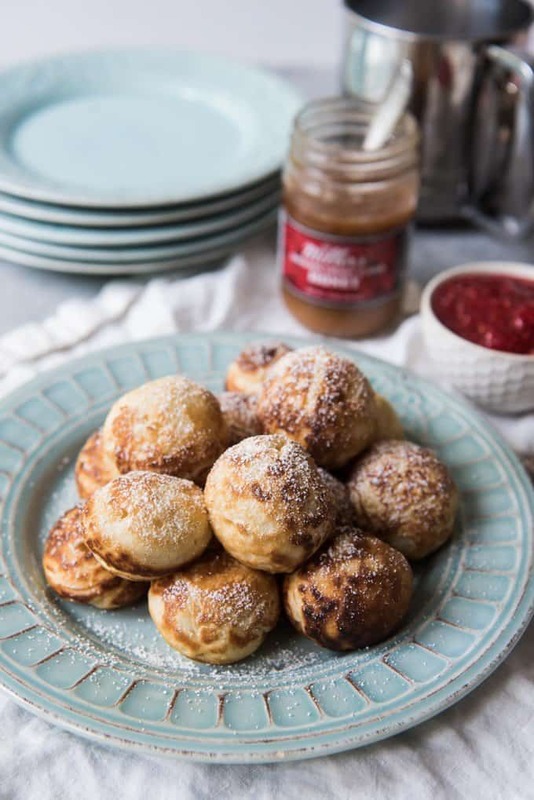 And there are lots of other aebleskiver variations that you can make with different fillings or flavors for even more breakfast or dessert options. You will want to make sure the pan isn’t too hot, especially if your aebleskiver pan is a heavy cast iron one like mine that retains heat really well. 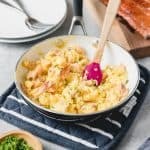 Medium or medium-low heat works well for me but it might take you a batch to figure out what works best for you on your stove and with your pan. Just remember that if the heat is too high, the aebleskiver will cook unevenly and you might have trouble getting them cooked all the way through. 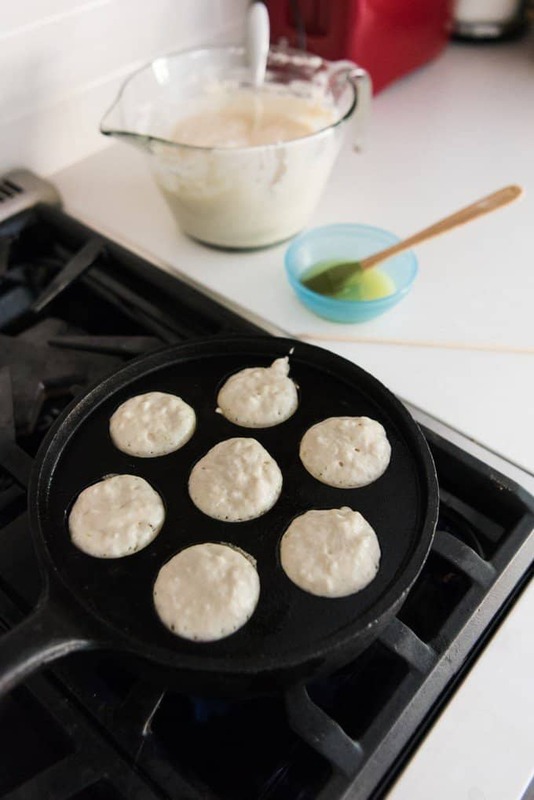 When you are ready to cook, you will fill each cup almost to the top, then let the aebleskiver cook until bubbles start to appear around the edges on top. Then you will use a sharp tool to rotate the partially cooked balls of dough around in their individual cups until they form spheres and are cooked through. You will also need a pastry brush to brush melted butter into the cups of your aebleskiver pan before adding the batter. It will help prevent the batter from sticking, as well as add flavor and texture to these danish pancake balls. The last tool that will come in handy is a knitting needle, chopstick, wooden skewer, or other poky implement that you can use to turn the aebleskiver as they cook. I like using a wooden skewer or chopstick, mostly because I don’t knit so I don’t own a knitting needle! But if you want to be really authentic, that’s what you should use. Start a new tradition this Christmas season with your family by making these tasty Danish Aebleskiver for a special breakfast or tasty dessert and talk about Christmas traditions around the world! Bonus points if you, like me, have Danish heritage that you want to learn more about! Do you have favorite family Christmas traditions that remind you of your heritage? I would love to hear about them in the comments below! Aebleskiver (or ebelskivers) are puffy Danish pancake balls and a traditional Danish dessert most often served during the Christmas season. Enjoy them year-round as a delicious breakfast treat! 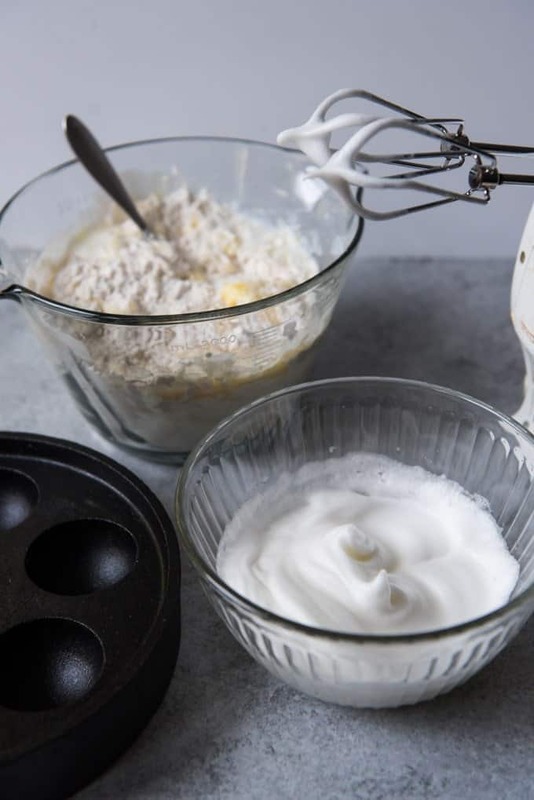 In a medium bowl, beat the egg whites with an electric mixer until stiff peaks form. In a separate, large bowl, combine the flour, baking powder, salt, baking soda, and sugar. Stir well, then add the egg yolks, melted butter and buttermilk and mix just until combined. 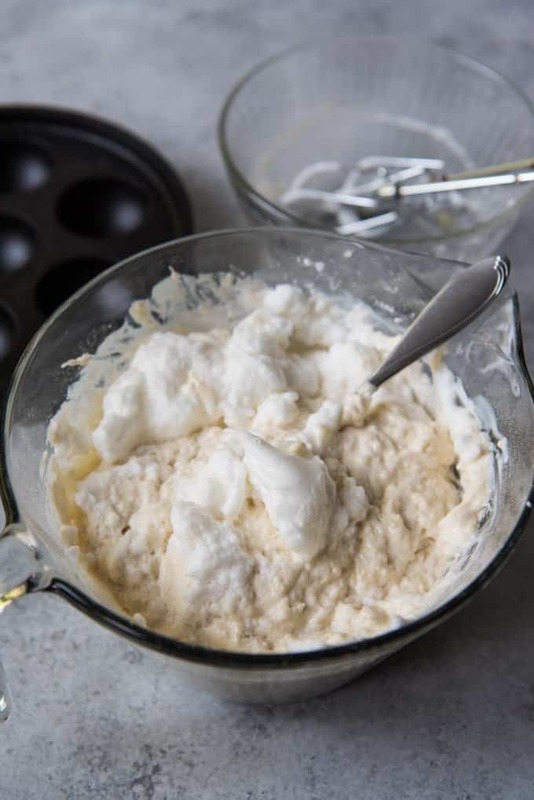 Gently fold the beaten egg whites into the batter. Batter will be fairly thick. Heat your aebleskiver pan over medium heat until hot. Brush each cup with a little melted butter using a pastry brush, then fill each cup with about 2 tablespoons of batter until almost full. 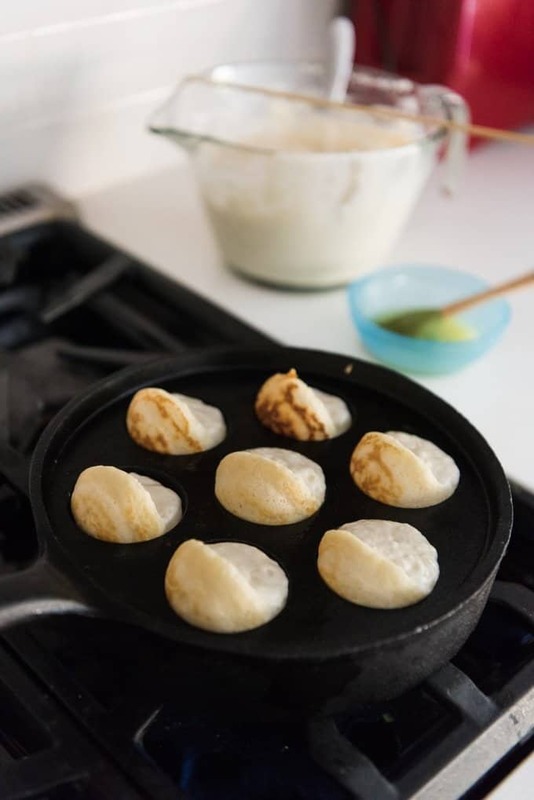 As soon as the aebleskivers begin to bubble around the edges, use a wooden skewer, chopstick, knitting needle, or fork to flip them over half way, letting the batter slide around to fill in the bottom of the cup. Continue cooking, turning the aebleskiver again to let the batter fill in the remainder of the sphere and continuing to turn until golden brown all the way around and cooked through. Transfer to a serving plate and dust with powdered sugar, then serve with jam (traditional), honey, cinnamon honey (my favorite! ), or even just syrup. If you enjoy baking and recreating authentic European recipes, you should definitely check out these Belgian Liège Waffles that are my other favorite dessert/breakfast indulgence! 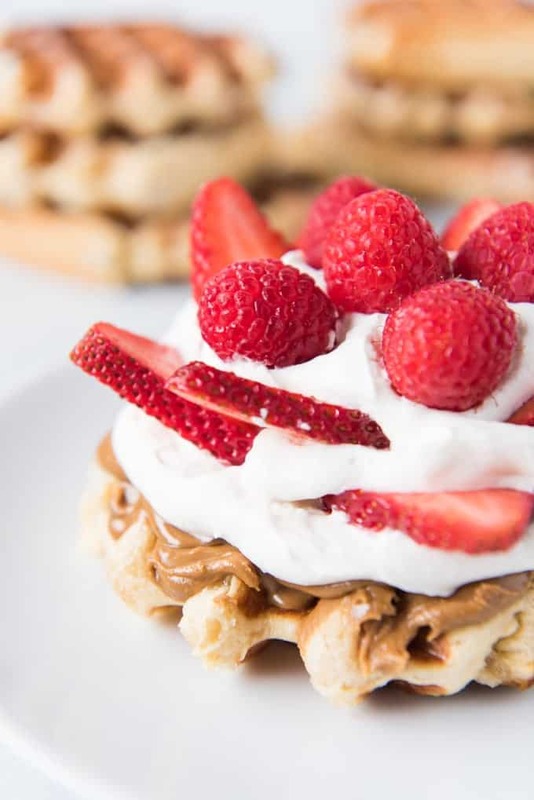 Especially when topped with cookie butter, freshly whipped cream, and strawberries & raspberries, just like the Red Wonder at Waffle Love in Utah! I just totally adore Aebleskivers!! I’ve stuffed mine with blueberries and cookie butter. So yummy! I’ve always wanted to try these – but still haven’t! Yours look so good they are making my mouth water. I love Æbleskiver! Yours look so light and fluffy. 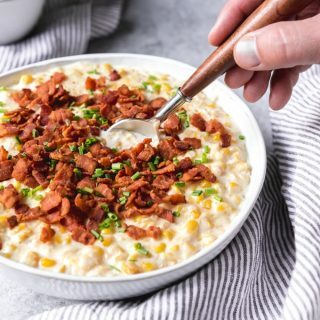 Makes me want to pull out my pan this morning. I especially enjoy them filled with Nutella. These look fantastic! 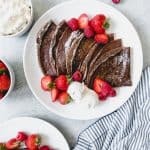 I’ve always been curious about Danish pancakes as I’ve come across them often editing the pancakes feed for the FeedFeed so I am so glad to see this recipe – thanks so much for sharing! These little Danish pancakes look amazing! I love how versatile this sort of batter is, and how the egg whites are beaten first to make them so light. 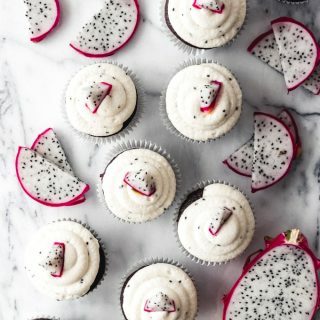 These sound absolutely delectable! I’m sure my little guy would love them since they’re just his size! How fun are these!!! And it’s such a unique method for making the batter. 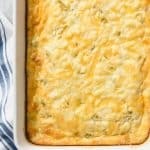 I wish I could try some before buying a pan! Not a big Danish population here in Charleston! Our Christmas tradition is making these Italian fried donuts (zeppole) for Christmas breakfast and eating them while opening gifts. http://www.pinchmeimeating.com/zeppole/ I don’t fry stuff a lot but it’s worth it for these! That is such a fun tradition Caroline! I love zeppole but haven’t had them in ages! 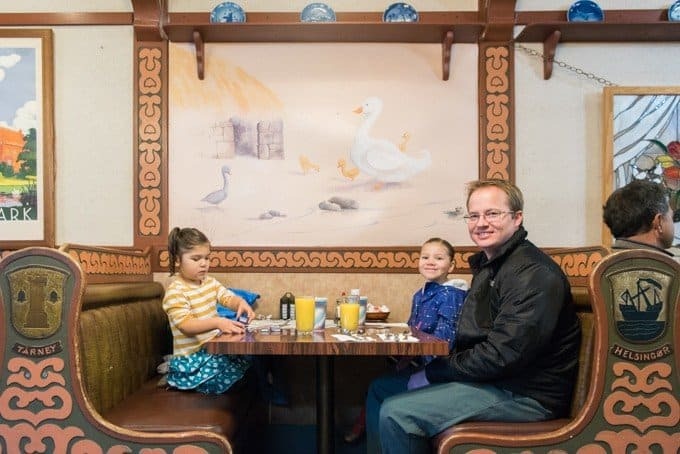 When I lived in New Jersey there was a little corner pizza place that served them in small paper bags full of powdered sugar that you would shake yourself and they were like heaven! Thnx for the recipe. 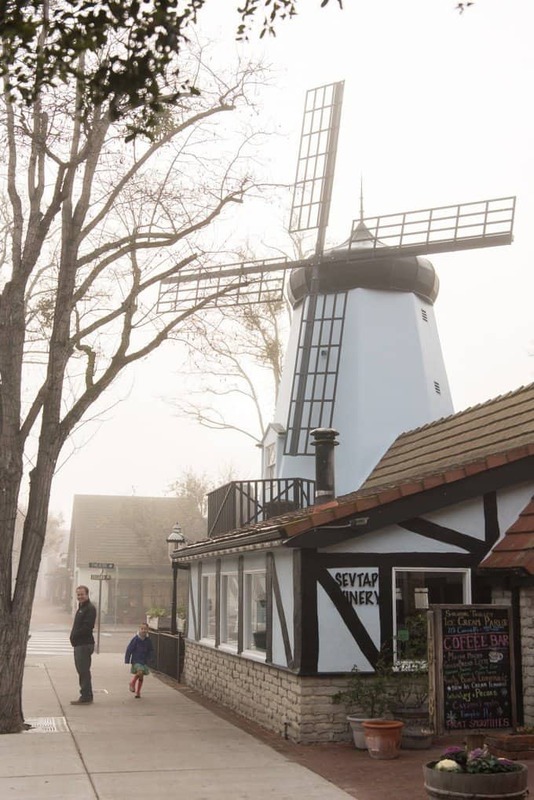 We go to Solvang often. Our neighbors used to make them. Our son talked me into the pan. I’ll have to make them again. It’s been a while.